Made from the tropical manioc plant, a.k.a. cassava or yucca. Ingredients: Manioc (tapioca) flour, modified manioc starch, dry milk, and salt. Package includes directions for rolls or sticks along with tips on making pizza. 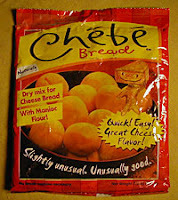 Their web site, www.chebe.com as recipes for hamburger buns, different flavored rolls, cinnamon balls, and more. Chébe Bread can also be frozen.